Caring for a dog with anxiety can be very difficult. Symptoms range from shaking and barking, through to aggressive behavior and even making themselves ill. No owner wants to see their dog go through this and may try many ways to prevent anxiety in their pet pooch. One of the best methods is using an anxiety vest. However, with so diverse types available, how do you know which is the best? Our panel of dog lovers and animal experts have compiled a list of the 5 best dog anxiety vests to help answer this question. 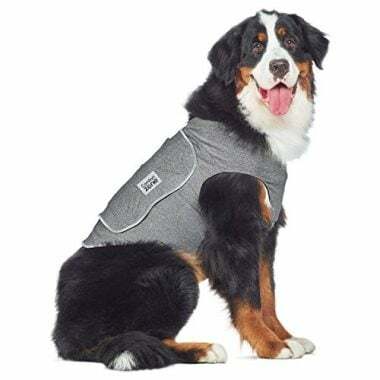 The ThunderShirt Classic is perfect for large dogs who need a little extra support during loud or stressful situations. 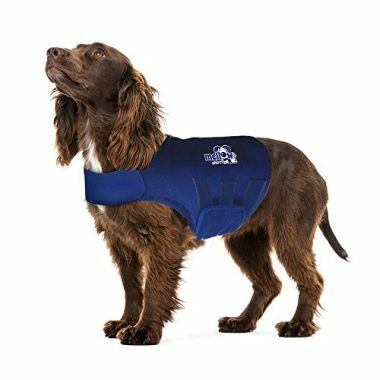 The jacket is adjustable and specifically designed to apply just the right amount of pressure to calm your dog. 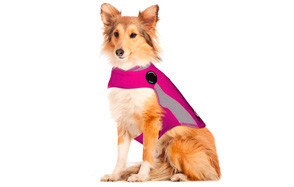 The jacket provides an alternative to using drugs to calm a nervous dog or one exhibiting separation anxiety. It is durable and machine washable, as well as being comfortable for your dog to wear. 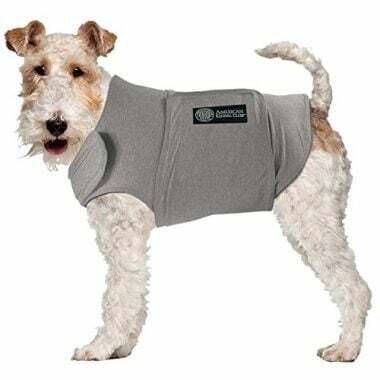 Whether your dog suffers from crate anxiety, car anxiety, or just hates loud and unexpected noises the Anti Anxiety and Stress Relief Calming coat from the AKC can help. Designed to fit comfortably around your dog and to apply pressure in much the same way as swaddling does with an infant. The coat is fully adjustable to meet your dog’s specific needs and shape. The Dog Anxiety Calming Wrap by Mellow Shirt provides comfort and style, while also offering a drug free way of calming your dog in stressful situations. The wrap around style is easy to fit to your dog and does not require any difficult maneuvers, there are no slits or head holes to worry about. The wrap stays in place with the help of hook and loop fasteners and can be adjusted to meet your dog’s needs. 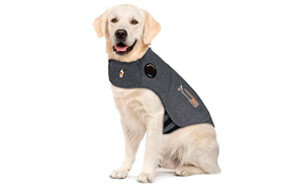 The ThunderShirt Polo Dog Anxiety Jacket has the additional benefit of the ThunderSpray Patch. Here you can add an essential oil spray especially designed to help calm very nervous dogs. The scents in the spray work with the pressure provided by the jacket to relax and calm your dog. The wrap round design is easy to fit to even the most energetic of dogs and the jacket can be adjusted to provide just the right amount of pressure for your pooch. Created from soft, durable and breathable material, the Comfort Zone Calming Vest provides gentle, constant swaddling like pressure to support and calm your dog during stressful situations. It is suitable for use in a range of situations including fireworks and thunder and is suitable for use with dogs suffering from separation anxiety. The Complete Comfort Compression Technology provides full chest fit, enabling maximum coverage of your dog’s torso. When looking for the best anxiety vest for your four-legged friend, it can help to know more about how the vests work and what you need to consider when looking for such a vest. Here we look to answer these and other questions to help you make the right decision for your dog so that they can enjoy a less stressful and anxious life. How Does a Dog Anxiety Vest Work? Dogs, just like most humans need comfort and closeness when they are feeling scared. As their pack leader, it is your job to keep the pack safe. Your dog feels safest when close to you. This is one of the reasons why they cuddle into you or look for you in unfamiliar situations and when things happen that they are unsure of. However, as much as you may want to, you cannot always be there to cuddles and unfortunately, there are also many aspects of the environment that you cannot control. This includes loud noises outside the home, thunder, and other extreme weathers. You also need to sometimes leave the house without your dog. There are also stressful situations that you as pack leader must put your dog into, whether you want to or not, including visits to the veterinarians. In these and other circumstances, a dog anxiety vest acts as a substitute to a cuddle from you, the pack leader. 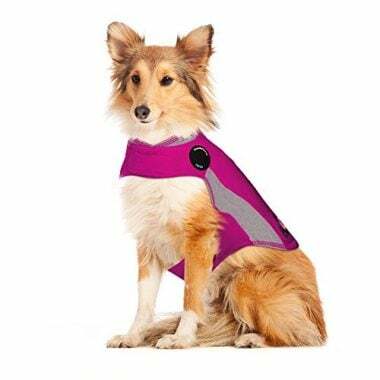 Anxiety vests wrap around the core of your dog providing a sense of closeness and comfort. They are usually made from a slightly weighted material that provides consistent pressure across your dog’s body so that they feel as if they are being held. The vest works in much the same way as swaddling an infant does. The pressure they feel has the same physiological effect as being held, and this, in turn, calms the dog’s anxieties. Several surveys have been conducted into anxiety vests on dogs and cats and all show around an 80% success rate in relieving anxiety. When to Use a Dog Anxiety Vest? The vests have also been shown to be effective for dogs that suffer from separation anxiety. Providing a vest for such a dog means that you are less likely to come home to noise complaints from the neighbors and destroyed furniture. The vests are not designed to be worn all the time, but as long as you regularly check your dog’s comfort and the health of the vest, there is no specific time limit to how long it can be worn at any one time. 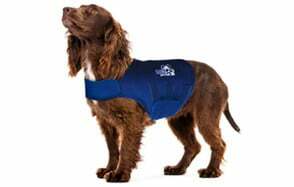 There are numerous anxiety vests on the market and they differ in everything from how they need to be fitted to your dog, to the type of material they are made from. It is essential to take these and other points into consideration when looking for the right vest for your dog. It is crucial that the vest you buy fits your dog perfectly, otherwise, it will not be effective. While most vests are adjustable, there are limits to how big or small you can make them. Before you buy a dog anxiety vest, check your dog’s weight and their chest measurement and choose a vest that suits these measurements. Also, take note of the length of the vest, especially if you have a short bodied male dog. You don’t want the vest interfering with their ability to go to the toilet. Some vests are designed to wrap around your dog, meaning that there are no slits or holes that you need to get parts of your dog into. These vests tend to be better for dogs who are unused to clothes or who don’t like being handled (opposed to held) when anxious. Most vests use Velcro style fastening strips as these make the vests flexible and adjustable. Others use hook and loop systems, either independently or in addition to Velcro style strips. Hook and loop systems can be tricky to do up, especially if your dog is not very good at staying still and practice may be needed to get the fastenings done up correctly. The main problem with anything like Velcro is that your dog’s hair can become trapped in it, this is especially true with long-haired dogs. If you choose this type of fastening, be sure to check for caught hair as soon as you have fitted the vest. While you want your dog to be comforted and comfortable in their vest, you do not want them to overheat. For this reason, it is preferable to look for a vest that uses breathable materials. 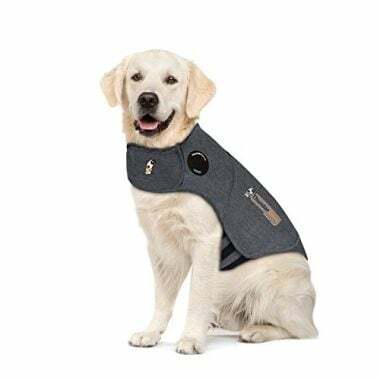 It is also beneficial if the vest is machine washable as this helps to reduce mess and smells, especially if your dog is going to wear the vest outside. While the anxiety vest works perfectly well on its own for most dogs, others may require additional support. Some vests accommodate the needs of very anxious dogs by adding a spray patch where you can add natural sprays and scents that help to calm your canine companion. If you are going down this route it is important to only use sprays that are designed for dogs. Calming an anxious dog can take time, even with an anxiety vest. Firstly, you need to identify the source of the anxiety and determine whether this is something that you can train your dog to overcome. For example, if your dog is anxious around new people, then using the vest in combination with socialization training produces the best long-term results. You need to introduce your dog to the vest slowly so that they do not see it as a threat or a punishment. This may involve giving them time to sniff and roll on it before you first try to put it on. When you do put it on for the first time, it should be in a situation where your dog is comfortable and not anxious (where possible). Make this a fun activity, involving lots of praise and treats as they allow you to fit the vest correctly. Be guided by your dog through their response and behavior as to whether the vest is comfortable and fitted correctly. Some owners notice an immediate change in their dog’s behavior, but for others, it may take a little time. It is crucial that you stay with your dog the first time they wear the vest in a situation that causes anxiety so that you can gauge whether it is properly fitted and working. If it is separation anxiety that causes the issues, then only leave the house for a short time, and if possible stay close so you can listen for any barking or howling. Praise your dog after the situation has past and remove the vest when you are confident that your dog is ready for you to do so. If you follow these tips you should see a noticeable and positive change in your dog’s behavior and overall wellbeing. In turn, this should make your life less stressful and mean that you can focus on spending quality time with your pet pooch, rather than worrying about constantly replacing the furniture.